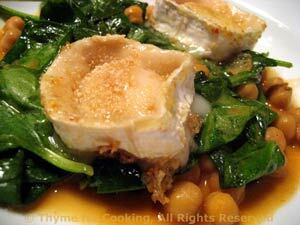 Warm Spinach and Chickpea Salad with Toasted Goat Cheese, healthy gourmet. Spinach is a cool weather crop that makes great warm or wilted salads in late fall as well as early spring. A bit of mustard and paprika adds a zesty flavor to the dressing. Melting goat cheese is the final touch. Wash and stem spinach if needed. Drain in a colander. If you don't feel you need to wash it - do it anyway. We want a little bit of water on the leaves - what ever is left after draining well. Open, drain and rinse the chickpeas; refrigerate what isn't used. Slice goat cheese into 4 slices, about 3/4" (2cm) thick. Dip both sides in bread crumbs, pressing a bit so they stick, and set aside. In a medium nonstick skillet heat mustard, paprika, oil and vinegar. Add chickpeas and sauté briefly until heated through. Add spinach and sauté, stirring constantly, until about half of it is wilted. Divide and place into 2 flattish soup bowls or salad plates. Add goat cheese to skillet and quickly fry, just until the edges look runny, turning once, 1 - 2 minutes total time. Remove and place on top of salads. Serve.